It will be a chilly Monday morning with low temperatures in the upper 40s. By the afternoon, expect lots of sunshine and spring-like high temps in the mid 70s. By Tuesday we’ll climb to the lower 80s with lots of sun! Clouds will build in Tuesday night and into Wednesday ahead of our next storm system that will bring showers and possibly strong to severe storms mainly overnight Wednesday into Thursday. The SPC has already outlined Acadiana under a Slight Risk (Level 2 out of 5) and portions of northern LA under an Enhanced Risk (Level 3 out of 5). The main impact looks to be damaging winds for now but we’ll have a better idea as we get closer to the event. I know we’ve lucked out the past 2 weekends, but do not let your guard down and take watches/warnings seriously! 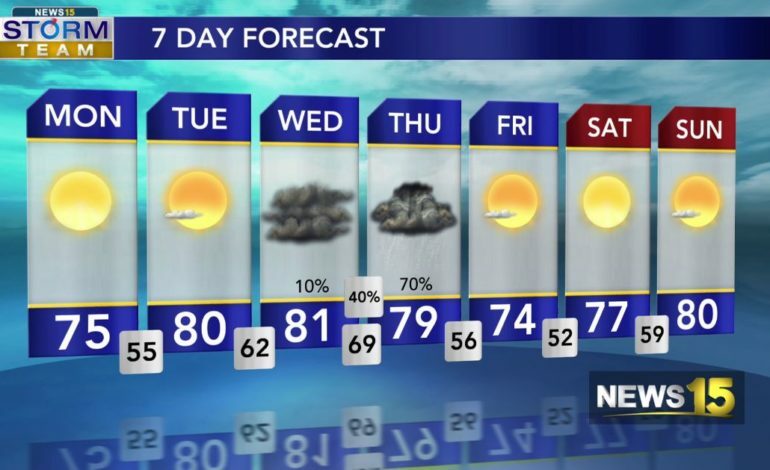 We should dry out Thursday night and sunshine returns Friday through the weekend.